“We shall bring you to Absolute Truth, Absolute Light, Absolute Bliss. Many adepts throughout the ages have sought to do this; but their words have been perverted by their successors, and again and again the Veil has fallen upon the Holy of Holies. 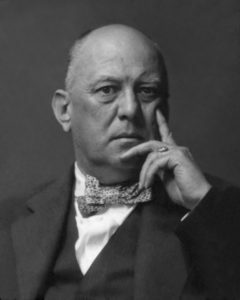 Aleister Crowley was the founder of the philosophical and religious system known as Thelema. In addition to his extensive writing about all things occult, he was publishing poetry, producing paintings, climbing mountains, setting records as a rock climber, some of which still stand today; and also traveling the world in search of mystical, yogic, and ceremonial systems of spiritual attainment. In the year 1904, while honeymooning in Cairo, Egypt, a series of events occurred that caused Crowley to have a profound Spiritual experience. During the course of these events, he was instructed to “shut himself up in a certain room of his house for one hour daily for three days (April 8–10, 1904 E.V.) that he might write what should then be given to him.”– Liber DCLXVI. Crowley did as he was instructed, and on each of those days, between the hours of noon and 1pm, Crowley “received” a text. He described the experience as if there was a man standing over his left shoulder dictating the words to him. He was merely writing it down. The writings produced during these experiences culminated into a three-chapter text that we know today as Liber AL vel Legis- The Book of the Law. Today, as in his own time period, Aleister Crowley is often misunderstood, even by people in the occult community. His reputation has often been wrongly smeared by those who believe the “hype”, rather than actually looking deeper into the man’s work. A wonderful collection of articles debunking popular myths surrounding Crowley can be found here.